The past couple of weeks I’ve been stalled in the shop, I’m happy to report I was able to move past it this weekend and finally make some progress. Rewinding, I decided that I wanted to incorporate marquetry into a real project. Not just little practice panels, but a small cabinet or something. Maybe a tool chest with marquetry inside the lid. But before I could do that I needed a way to press larger marquetry panels. The process I’ve been using involved first laminating newsprint onto the show face of the veneer to reinforce it. Then assembling a packet of six or more layers of veneer and backer materials and sawing out the design. The parts are assembled face down onto a kraft paper covered board, then flipped and glued to the final substrate. A lot of manipulation and clamp juggling, more than is good for my blood pressure. So this project, building a press, is a necessary step for me. Or so I’ve convinced myself. 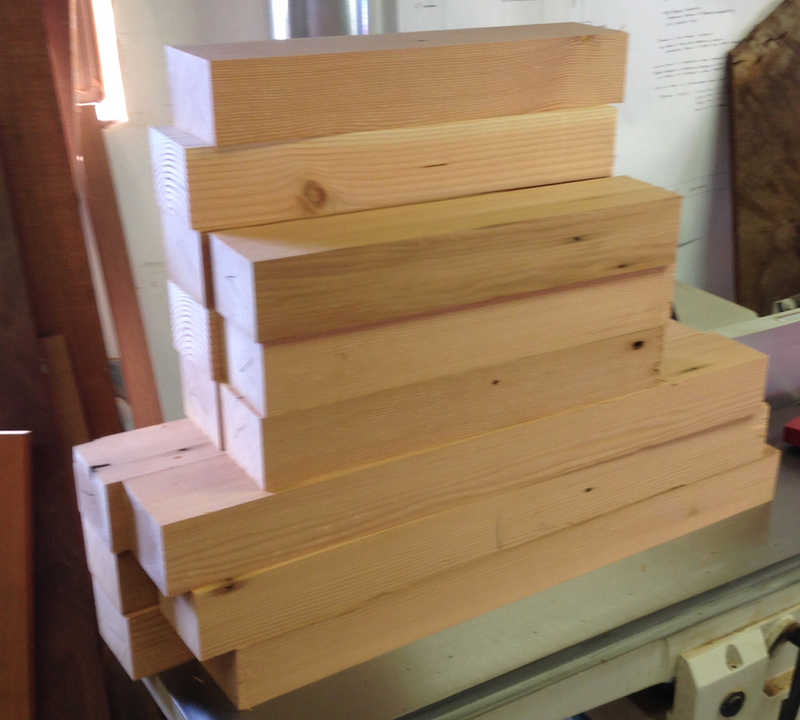 Last weekend I got the reclaimed fir rough machined, at the expense of two bandsaw blades ruined on embedded nails. Out of two 14′ long 4″ x 6″ reclaimed beams I still ended up short on materials due to nails and cracks and rot. I had enough offcuts that I was able to laminate some of them to make up the shortage. I was short two of the 19″ long vertical posts, so I laminated some scraps from the reclaimed wood. 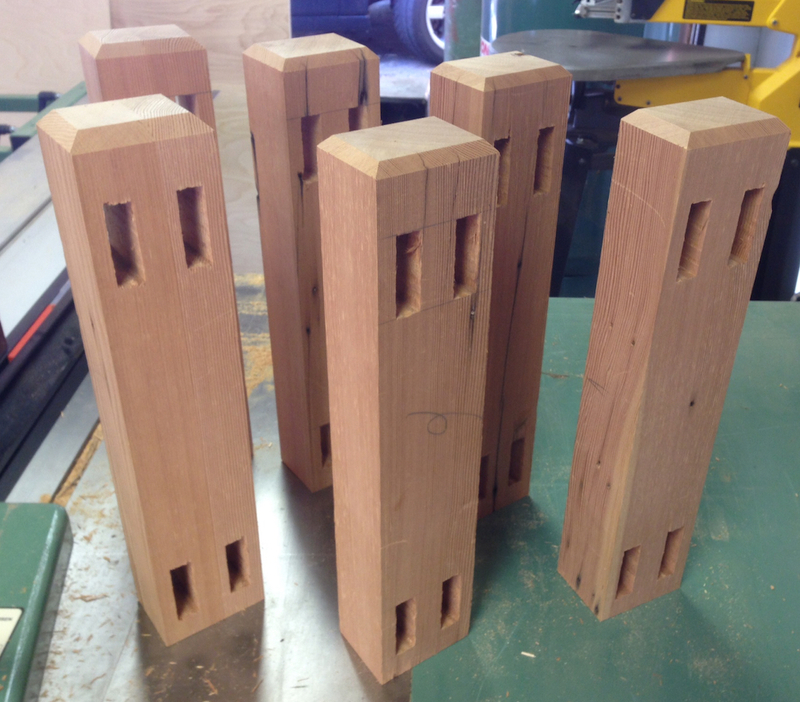 Once the scraps were laminated, I machined everything to the final size, about 3″ x 4″. I still have the two “green” replacement posts in this stack…just in case something was wrong with one of the other parts. I’m happy to report I won’t be needing them. Parts all machined to the final dimensions and cut to the final length. This was intended to be a quick and dirty project. I laid out the mortises and cut them, then rough cut the tenons, with the intention of doing a little fine tuning to get the final fit. 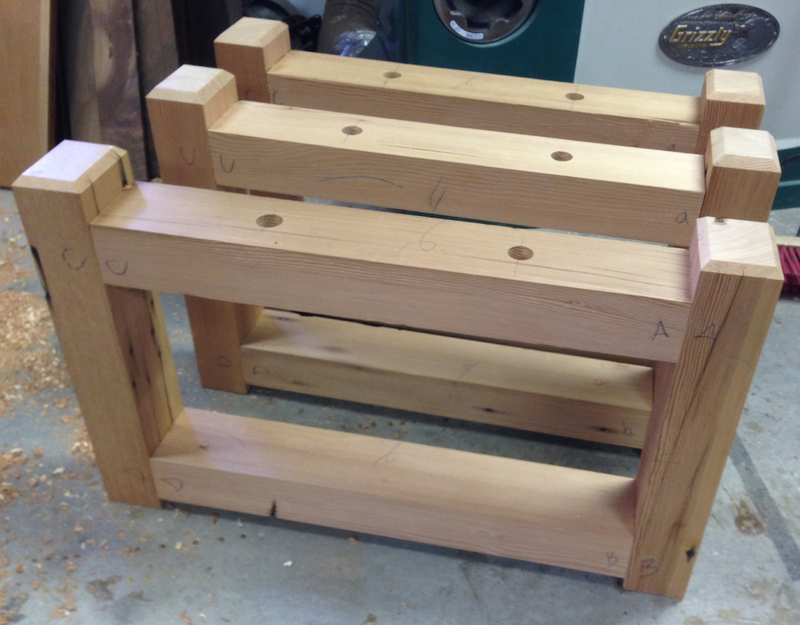 The very first mortise/tenon fit up was a struggle, and ended up having a snug but gappy fit. All of the rest of the joints went together smoothly. Not big gaps, with a snug fit that required a hammer to assemble. I used my power tools on the joinery, because it’s quick and consistent. But it always feels like cheating. 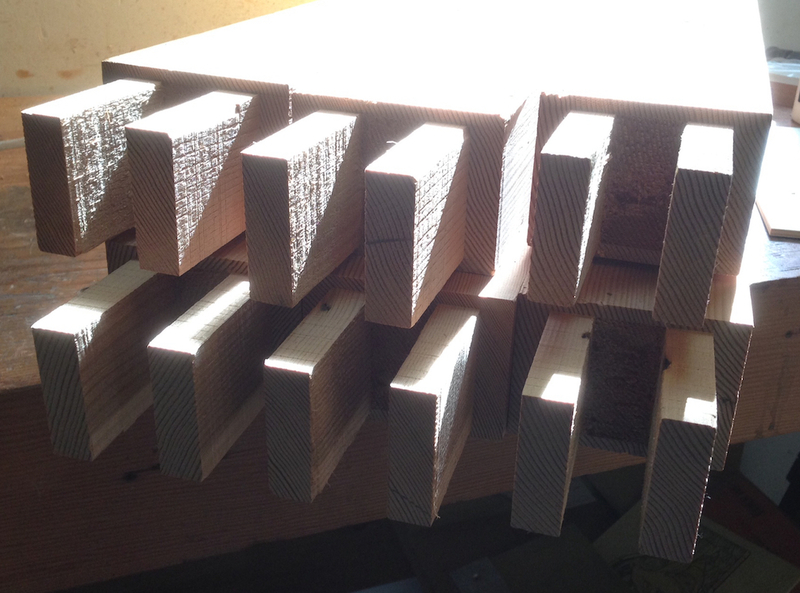 In retrospect this probably would have been a good time to practice sawing tenons by hand. Chopping mortises in fir is not my idea of fun. The Sapele I used on the Marquetry Chevalet cut really nicely with a chisel, but my experience with fir is that it dulls tools and doesn’t shop across the grain well at all. 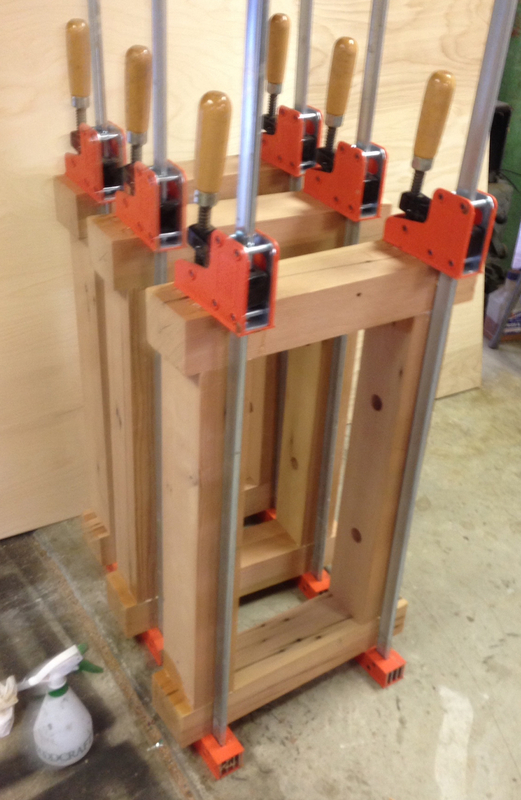 I dry fit all three frames for the press, drilled the holes for the press screws, and disassembled the frames so I could sand the inside faces. Then I glued the joints and cinched up the clamps to draw everything tight. I’ll pull the clamps this week and do the final cleanup so I can check this one off. I think the fir will look good with some oil/varnish applied. Looking good Joe, the chamfers are a really nice tough. Solid looking frames. I just can’t get over the grain in that old growth fir. Beautiful stuff. As to chopping joinery in fir. You don’t so much chop fir, but pare away the unwanted bits. LOL Fir has so much compression. Sharp tools and small bites are the order of day or it becomes a hacked up mess. Which is odd. Fir is also very stiff and perfect for your chosen application. These are shaping up to be very nice shop fixtures indeed. What is the capacity? How big can the panel to be pressed be? Just under 24″ wide, probably up to about 36″ long. Way bigger than I’ll ever do!